Do you hold a kindergarten graduation? If not, why not? We do a Graduation Ceremony. It is super cute and the parents love it. It’s a lot of work and I should mention I’m at a private school. We do not do a graduation and I am more than fine with it. Our building is preschool thru 6th Grade so there’s no graduating till 6th Grade. We do a K celebration for all students. Even those being retained get a certificate for participating in kindergarten. We do a slide show and some sixth graders give a welcome speech. The parents really enjoy it. We do a school-wide celebration. I believe we call it the end of the year celebration. The kids get their certificate of completion. We show a photo-story of the year, narrated by the students. Although “cute,” I do not think K (or preschool, 5th grade, etc.) graduations are appropriate. We give too many things to children too young and I believe that takes away the solemnity and excitement or the “real thing.” I would suggest that if you want to do something, just put on a little “show” highlighting some of the things the children have learned. We do nothing. I celebrate the progress my students made during the year and for completing kindergarten with them in class. Graduation is for high school and maybe middle school. We used to do an all-out Spring Show years ago. With the advent of comprehensive testing, we now do a much shorter program. Each child in the kindergarten steps up to the mic and tells the audience what they learned in kindergarten, or his/her favorite part of the year. Then each child receives a kindergarten certificate (not a diploma ). It was very well received last year. We do certificates. They go home with their report cards. I enclose a class photo as well. I SO agree with many. What will our kids have to look forward to if we keep offering these kind of events earlier and earlier? When a first grader goes in a limo to the Father/daughter dance, what will she want for prom – a helicopter? When a kindergartener has pedicures and highlights, what will she ask for at 15 – liposuction? When kids wear cheetah print and sequins at 3, don’t be surprised when their teenage attire is wilder. And to those who say the parents love the graduation…shame on the parents. Celebrate your children by letting them be children! Signed a K teacher who NEVER held a graduation in 20 years. We do a presentation of our farm work this week with songs, writing, computer pics , etc . Then, at the end of the year, we have a beach party and watch our slide show! We do kindergarten field day. The kids have races then we have a picnic with all of our families. My kids are not graduating. They are going down the hall. I totally agree that we celebrate too many “little” things and it takes away from the big ones. No graduation, but instead I do a special final lesson in our character education program that highlights/celebrates important social growth. Every child gets a paper heart corresponding to 2nd step lesson, such as learning to name feelings or solving problems with words. It becomes very meaningful, plus is a great review of our lessons. Parents are not invited, so I don’t have to worry as much about the wording. I also hold an “author’s tea” to celebrate our writing on the last day and families come to that. I let the kids plan it, decorate, create invites, etc and it keeps them busy in a good way in our last week. 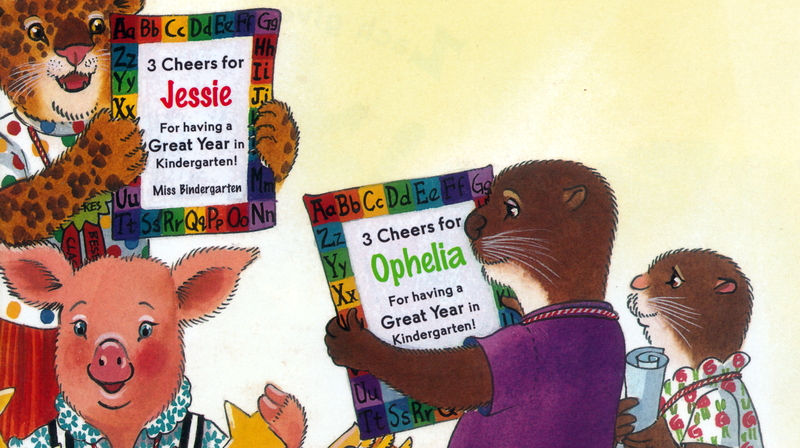 So glad to see I am not alone in not having a Kindergarten “graduation”. We decorate and sign each others scrapbook I put together for each student with photos, work, etc. We participate in school wide activities (6th Grade graduation), read Mrs. Spitzer’s Garden, we do some last singing and dancing to favorite songs from throughout the year and just enjoy our last moments as a Kindergarten family. Fly up ceremony. It culminates our insect unit and life cycles. We compare the year to the students growing like the butterfly life cycle. Then the students make life size wings and wear them for our fly up ceremony. This is also our Spring Parent Program. So there is some songs and other stuff. Lasts 1/2 hour at most. We are a private school. No graduation. They have plenty of “graduations” later. We look through each others portfolios, sign year books and go outside for Popsicles, bubbles, and chalk. It’s perfect! No graduation here! We do a Farewell to Kindergarten with songs, dances and poems. The children receive certificates and we give out kindness awards. No graduation but we do an awards ceremony where all the kids get something! We do an end of the year party. Always in a fun luau theme! We do not do graduation as they are not really graduating and some will be staying in kindergarten another year. I make an end-of-the-year recipe book with the kids where they interpret their favorite recipes that I combine into a book and have them sign their signature to the recipe. I make a copy for each kid to take home with them and I include a special end-of-the-year note on the inside with my signature and picture. My kindergarten teacher did this when I was in kindergarten and I still have it and read it to the students! This is always a big hit with my kindergarten families! Kindergarten Celebration, not graduation. We order matching Tee shirts, sing a few songs on stage, have a slide show of photos from the year and then all have a scoop of ice cream on the front lawn. Done. No graduation! End of year celebration with either a field trip or kindergarten play and a party! We do a kindergarten celebration. They sing songs on the stage and say their favorite thing about kindergarten. We might do a social afterwards this year but not sure. Definitely not a graduation! No graduation for us. What is there to “graduate” to….the room down the hall? Going from K to 1st isn’t even a big deal anymore now that we’re in our 2nd year of full day K. We do a Kindergarten Concert instead. We do a kindergarten celebration where we sing songs and present the students with a certificate of completion of one year of kindergarten. We are trying to get rid of it but it’s “tradition” so until we get a new principal it’s staying. Personally, I feel it’s inappropriate too. We have minimized it to a couple songs, certificates, and cake. We do not do graduation. The students put on an end of year program for their family of different things they learned about that year followed by an awards ceremony. Every child gets an award. We do a big thing that is really hard. It has downsized recently but the time is just not there, and they don’t memorize lines well. Against….but overruled by school committee so now we have “end of Year Celebrations”…but they still wear graduation hats…They sing songs and get a “diploma” but its NOT a graduation. You can decide but I still think its a graduation! Each K class does their own Readers’ Theatre celebration in their own classroom with parents. We use scripts from the I’ll Read to You, You Read to Me series and we pair off the kids loosely based on their reading levels. We also have each student share a poem that they wrote from our poetry unit with their parents, privately. Our Music teacher teaches all of our Kinders a First Grade song that each class performs at their celebration. Lastly I read “I knew You Could” and give out fun achievement awards. We then have Popsicles and sometimes cake outside in our courtyard. Whole thing takes about 1.5 hrs on the 2nd to last day of school. We do graduation, as it was there before me and really can’t stop doing it. It’s too much of a tradition. Students buy or borrow cap, gowns, tassels and a cute little class ring with the year! I feel that it’s kind of a big deal, graduating from their 1st year in a big school, not JUST down the hall. I think Amy’s comment is totally inappropriate, not sure where your students are from but no child at my school would EVER ask for any of those things. I’ve seen babies wearing cheetah print, and comparing pedicures to liposuction is just idiotic!! No graduation here, and I’m so glad. Save graduation for high school. I make my students a fun photo album of kindergarten including special events, field trips, and candid shots of every day things. We have a family day at the nearby playground during the second-to-last week of school, and then a celebration on stage on the last day. The children perform a couple of songs, and we show a slideshow. I think Amy’s post is totally right-on. In the 90’s our school had K graduations and there were limos, high heels, etc. Ridiculous. Against….what do you do with the little one that has to be retained?? We are not allowed to have one. The county decided that the only grade allowed to have a graduation is 12th. We have a ceremony and a celebration, but our district won’t let us call it graduation. Glad to hear so many others agree that we overdo way too much, creating events more with adults in mind than with children’s best interests. We hold an arts celebration near the end of the year, integrating music, writing, science and art. Short, simple, with cookies– child-friendly!